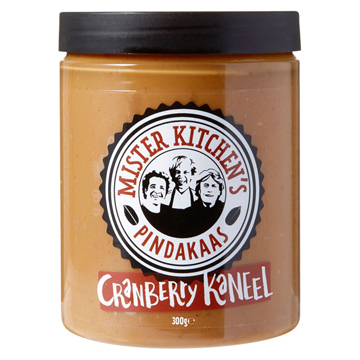 Mister Kitchen makes peanut butter without nonsense and more flavors. Enjoy dried cranberries with a subtle touch of cinnamon. Only of slow roasted Argentinian peanuts Rich in fiber. Source of proteins and vitamins Gluten-free, vegan, no preservatives Contains only uncured RSPO certified palm oil and coconut oil Description Peanut butter with cranberry & cinnamon Extra information Mister Kitchen is crazy about peanut butter and the kitchen wrapped in fresh recipes and exciting flavors. We grate the best Argentinian peanuts in their nutritious fleece and grind them to the right soreness. Then we add our favorite ingredients for unique flavors. Oh la la, live the peanut! Content and weight 330 grams. Does not contain gluten Ingredients Ingredients: PINDA 77.9%, cranberry 10%, coconut oil, uncured palm oil, sunflower oil, sugar, cinnamon 0.3%, salt. Not suitable for consumers with a peanut or nut allergy. Allergy information Contains: peanuts (groundnuts). Can contain: notes.